Ask your mum for your favourite yoghurt. Open it up. Tear a pouch of Fizz Wiz strawberry or cherry open and pour it onto the yoghurt. Stir up gently and taste it. Yum! I bet it will be the funniest yoghurt you've ever had! Top the toast with marmite, jam, fruit spread, peanut butter or chocolate spread, whatever you prefer. 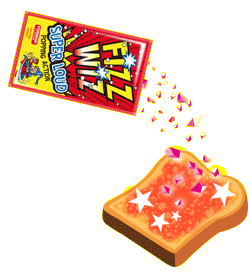 taste the fizziest toast you have ever had! Perfect for birthday celebrations, it brings magic to your mouth and it will shock your friends! 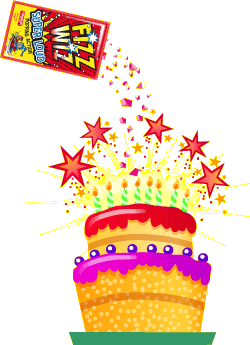 Or if you prefer to have the funniest birthday cake sprinkle Fizz Wiz just before you are about to blow the candles, your friends will certainly love it! No more boring baths. Ask your mum to fill your bath tube up with an adequate quantity of water at a suitable temperature for you. Pour one pouch of Fizz Wiz on it and listen to the crackling and popping coming out of the water.